Are you planning your last RV trip of the Summer before kids go back to school? Are you planning your final RV trip before kids go back to school? Here are a few tips we came across on Forbes.com to help with planning your last trip of the Summer. 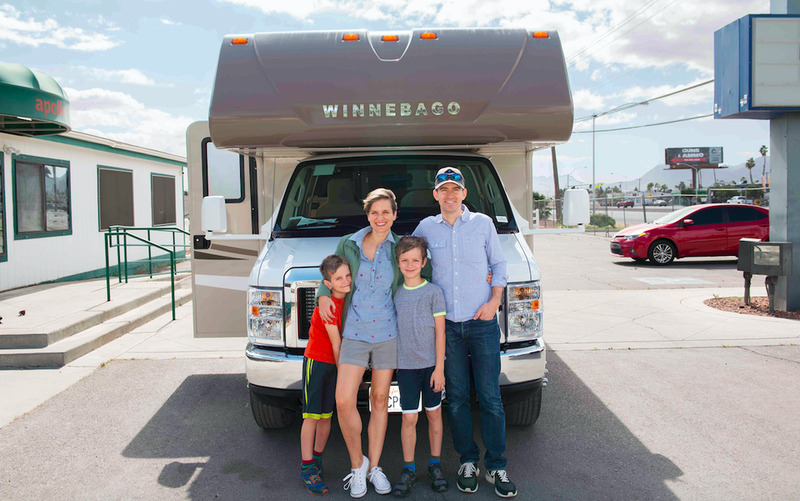 ..We got Pettit from Forbes.com, who has gone on more than 100 RV trips, to share her insight on why this kind of travel is so hot, along with her tips on how to pick the right RV, what to bring and more. And read on for Redbook’s picks for the five best affordable campgrounds around the country. 1. You can go where you want. What’s your interest? Model trains? Fiber arts? Chances are there is a museum or workshop covering your interest that you would love, and traveling by RV is a great way to get there. RVs take you in comfort to places that planes don’t go. So if you’ve been wanting to visit the replica Hobbit Village in Trout Creek, Montana, you’re in luck. 2. It’s budget friendly. RV travel allows you to control your vacation budget in ways no other form of travel does. You can choose a range of campgrounds from state parks to RV resorts. You can cook your own food and you can determine how far from home you want to travel. 3. They’re people friendly. RV vacations lend themselves to making new friends. Fellow RVers love to share their experiences with great campgrounds, pretty side roads and don’t-miss restaurants. Caution: You may end up sharing dinner with strangers! 4. Nature is a tonic. We have the most beautiful state and national parks and they have a way of restoring tired spirits and renewing energy levels. Camping under the stars is a stress reliever and memory maker that hotels can’t offer. 5. You can visit family and friends. RV travel allows you to stop in those places that you normally fly over. You can visit your college roommate or your best man you haven’t seen in years — and they don’t even have to make up the guest room. 6. The food! In an RV, you can carry all your favorite foods and prepare your own meals. You can eat when you want, not when the hostess can seat you. You’re never stuck in long lines overpaying for mediocre foods or worrying about food allergies. Easy on the waist and budget. 7. It’s quality time. It really is all about the journey: Road trips give you the chance to spend quality time with loved ones. You can catch up, listen to an audible book together, reminisce about favorite past vacations, stop at fun places and make new memories while the miles roll by. 8. It’s pet friendly. RV travel allows your fur family members to travel with you in comfort. You don’t have to worry about them missing you in an impersonal pet boarding house and you save the kennel costs. 9. You’re always at home. Being able to vacation and end the day in your own bed with your own sheets, pillows and blankets is great. Having your own portable shower and toilet is priceless. 10. You can do back-roads driving. The ability to explore the two-lane highways of America and visit small towns, buy local goods, eat at mom and pop restaurants and connect to those whose lives are unlike ours increases our connection to other people. We’re not red or blue states, we’re fellow citizens. 1. Find the right rental company. Choose a company that fully stocks the RV with everything you will need: sheets, towels, cookware and table settings should come with it. Make sure the rental company does a hands-on orientation of the trailer prior to departure day. Trying to take in all that information on pick-up day is too much and not safe. Make sure your vehicle has enough towing capacity to accommodate the travel trailer you have rented and that you are property insured. If you’re renting a motorhome, make sure you know what kind of fuel the rental company wants you to use in it. Check the exterior of the trailer for dents or dings before taking it off the grounds, just as you would a rental car. At RV Northwest we have an A+ rating with the BBB and we love hearing about all the amazing trips that our customers enjoy with our rentals. People come back to us year after year for the quality of the rentals and the value they feel we have to offer. 2. Find the right RV. Prefer to bring your own car? Tow a travel trailer. They’re lightweight enough to carry behind a minivan or compact SUV. Some are tiny, while others come equipped with a kitchen, shower and more. They also offer the convenience of having your own car for sightseeing. Decide if you want something super easy to drive. In this case, a Class B Motorhome (also called a campervan) is the way to go. They range from 16- to 22-feet long and come tricked out with a kitchen, living room, bathroom (some have showers) and beds. Driving and parking one of these is a cinch. If you want lots of space, rent a Class C Motorhome. This is the most popular choice for big families or groups of friends. They start at 21 feet long and can sleep up to eight people. While RVs do come bigger, stick to one that’s 25 feet or less. That way you won’t have to worry about size restrictions at certain parks, and it’ll still feel like you’re navigating a car. 3. Follow these tips for driving and spending time in an RV. Plan driving days like your actual vacation days. Know ahead of time what your destination for the day is and how many hours you will drive that day. I like to plan so that I arrive at my final destination by 5 p.m. This gives me plenty of time to set up and meet the neighbors before dark. When planning your route, look at the map and see if there is a point of interest you want to stop at to take a driving break. One of my favorite parts of RV travel is that I have my home on wheels and I can pull over at a rest area and have the leftovers from last night’s dinner or a great lunch I’ve planned ahead, instead of rest stop fast food. (I can use my own bathroom, too!) Before getting back on the road I can take a little cat nap or do a few laps around the parking area to revive. I avoid driving fatigue by eating light, switching drivers every few hours and always wearing good polarized sunglasses. While driving I catch up on all the great RV podcasts. 4. Book the best campsite. When you’ve chosen the campground you want (see below), study the map of the campground sites online. I look for sites that are not adjacent to an access road. I prefer sites that back up to woods with no other trailers behind them and are not too close to the bathrooms. Even if the campground uses an online reservation system, it’s a good idea to call and talk to someone who works there. (Pro tip: Ask them what the coveted site is that everyone wants.) If you’re camping with young children, you may want to be right across from the playground. If you’re planning a quiet couples weekend, ask them for a secluded spot. Always book with as much advance notice as possible. 5. Download apps that enhance the camping experience. The National Parks app is one of my favorites. It has a lot of great features that allow you to maximize your visits to U.S. parks. It has a feature that allows you to download an app within the app for the park you want to visit. For instance, you can download the Yellowstone app, which helps you plan your trip, navigate the park, choose hikes based on your level of fitness and available time, save favorite spots within the park and share your trip with friends. I also use the GoRVing website for information and inspiration. Their bloggers share insider tips on favorite destinations and things to do around the area. Getting a first-hand recommendation on restaurant and sightseeing tours is like having an advance team. 6. Bring the right gear. I never hit the road without my Dutch oven cooking gear. I love to come back from a day of exploring and get a good camp dinner going. I also bring a comfortable campfire chair. I have the Cabela’s club chair, which feels like a big hug at the end of a long day. On the picnic table, I set up DIY lamps that I made from inexpensive Home Depot solar lights propped on thrift-store brass candlesticks. They soak up the light all day and cast beautiful light all night. I treasure my Camp Casual dinnerware: a set of Melamine dishes and bowls with a vintage trailer design on them that are indestructible. They stack nicely to save space, and their vintage vibe makes me and everyone happy. Other must-brings: paper maps (because GPS signals can fail in remote areas); bikes (an awesome way to explore); a wireless speaker (because driving in an RV can get a little loud and many don’t have satellite radio) and a privacy curtain (otherwise, your brightly lit cabin can turn into a fishbowl at night). Colter Bay Village RV Park – Moran, Wyoming (rates from $61 a night): This action-packed campground (swimming, kayaking, canoeing) is located inside Grand Teton National Park. Plus, there are full RV hookups — rare in a national park. James Island County Park – Charleston, South Carolina (rates from $48 a night): A 643-acre space that is part nature retreat, part amusement park, with waterslides, a 500-foot lazy river and more. Bay Center/Willapa Bay KOA – Bay Center, Washington (rates from $50 a night): In this shady spot, forest meets ocean, complete with flashlight candy hunts and root beer oat socials. Pizza, wings and burgers can be delivered right to your RV. Blue Bell Campground – Custer, South Dakota (rates from $25 a night): A campground in Custer State Park that’s like traveling back in time to the Old West. Don’t miss the hayride that ends with a chuck wagon dinner. Lynchburg/Blue Ridge KOA – Monroe, Virginia (rates from $45 a night): The perfect version of summer camp near the Blue Ridge Parkway: horseshoes, Ping-Pong, plus a pool and a stocked catch-and-release pond. This article was originally published on Forbes.com – click here for more articles like this one! If you’re feeling a little blue about Summer travels being over, don’t despair! Fall is an amazing time to take a road trip in the Pacific Northwest even if it is just for the weekend. Give us a call for rental availability we would love to help you plan the perfect RV getaway!